Ever wonder how marine mammals are trained to do fabulous jumps out of the water? 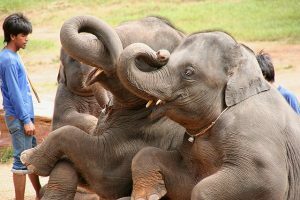 Or how elephants or tigers are trained to perform circus acts? Do you think their trainers taught them by yelling or throwing things at the animals or by physically correcting the bad behaviors? These animals are too massive and too strong to be trained that way. So how is it done? 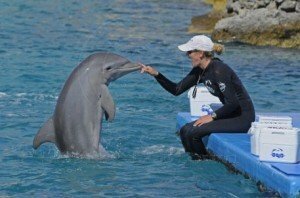 Marine mammals and exotic animals are trained using positive reinforcement training techniques. They are introduced to a marker, or a sound, that is followed by a reward that the animal enjoys. The animal quickly learns that every time they hear the marker, a reward will soon follow. Most often, food is used as the reward. Since food is a basic need for all animals to survive, they are willing to perform great feats to get this basic need fulfilled. This is how the training begins. A trainer will wait for an animal to do a natural, instinctual behavior and will mark the behavior with a sound, followed by a reward. Since the animal wants the reward, they will likely perform this behavior again. The trainer continues to mark the behavior and offer a reward, causing the animal to repeat the behavior more and more frequently; hence positively reinforcing a desired behavior. Rewards for animals can also be in other forms such as a play session with a toy, tactile praise, verbal praise, or anything the animal enjoys. It is the same principal as people getting paid for a job well done. We are more likely to perform a given task if we are being paid to do so. For people, money holds a high value; the more we are paid, often, the harder we will work. Animals are the same way; they just work on a different payment plan. Once the animal consistently performs the behavior for the reward, the trainer adds a hand signal and/or a verbal command to get the behavior upon request. As training progresses, the trainer may delay rewarding the behavior until they get a stronger response to the command. For example, a trainer has taught a dolphin to jump out of the water in response to a hand signal given by the trainer. But the trainer wants the dolphin to do a higher jump out of the water. So when the dolphin does a small jump, it is not marked or rewarded. This causes the animal to try harder to get a reward. The dolphin then does a bigger jump out of the water and it is marked and rewarded. The dolphin learns that only the best response, or high jumps, will reap rewards. When trainers use positive reinforcement, they are actively involving the animal in figuring out what behaviors will get more rewards. The animal is thinking, and willing to try new behaviors to continue to receive rewards. They are not reprimanded for incorrect behaviors, but are rewarded for doing behaviors we want to see more often. Here, you will have an animal that is not acting out of fear of what happens when they do something wrong, but out of confidence in trying to do something right. This type of training improves the bond between the animal, trainer and owner and builds a relationship based on trust and mutual respect.